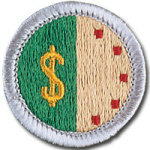 Carl Every is going to be hosting some Personal Management Merit Badge Clinics during the next few months. He will be running them 30 minutes before our scheduled meetings. The first one will be November 6th starting a 6 p.m.